A previously minor footnote on Page 57, Chapter 3 of the House Intelligence Committee report on Russian interference notes that FBI general counsel James Baker met with an unnamed person in September 2016 who provided information on the Russia case, including email hacking and a possible link to the Trump campaign. A top attorney for Perkins Coie, the Democratic National Committee's private law firm. 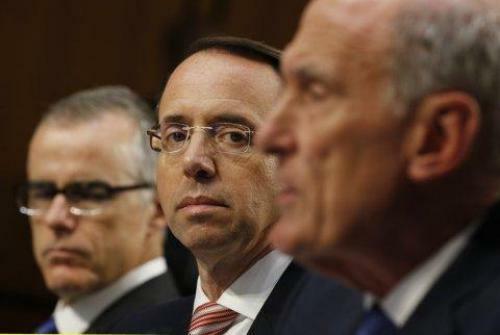 So the "big scary national security secret" was nothing more than a meeting between the FBI's former top attorney and a DNC attorney to discuss information the Committee had in the Russia investigation. Last week Baker was interviewed by lawmakers on Capitol Hill. While it was a closed-door hearing, much of Baker's testimony has leaked because he was not interviewed in a SCIF - a "sensitive compartmented information facility" which would typically be used if, say, a witness might convey an actual threat to national security. As Solomon reports, here was no claim of classification over any of the information he provided to congress that day. "So we can now say with some authority that the earlier redaction in Footnote 43 was done in the name of a national-security concern that did not exist," Solomon concludes. The DOJ similarly tried to conceal embarrassing information contained within text messages between FBI "lovebirds" Peter Strzok and Lisa Page, which had nothing to do with national security. Furthermore, when the FBI couldn't prove any collusion between Trump and the Kremlin, unverified claims were leaked to the media to keep the Russia "witch hunt" rolling. And that, is extremely embarrassing to say the least - not to mention extremely illegal.